The Ultimate Aim of Karate lies not in Victory nor in Defeat, But in the Perfection of the Character of it's Participants. The Martial Way Begins and Ends in Courtesy. The Heart of our Karate is Real fighting. There can be no Proof without Real Fighting. Without Proof, there is no Trust, Without Trust, there can be no Respect. 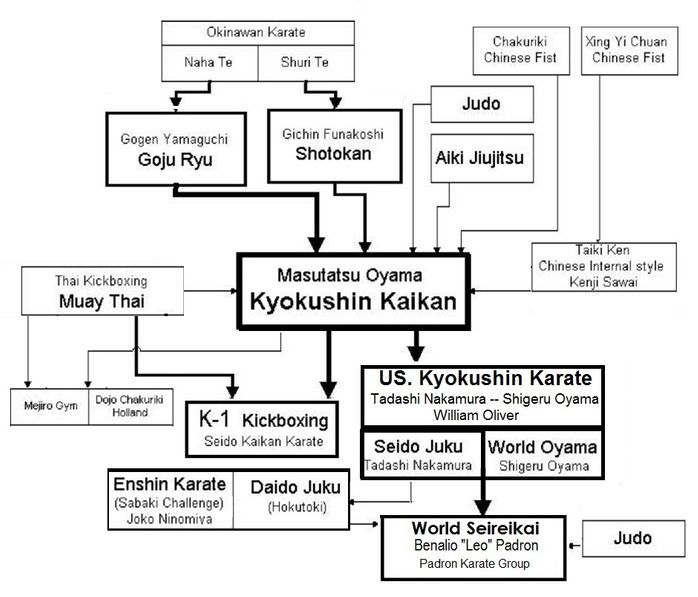 Seireikai Karate-Padron Dojo, (formerly Oyama Juku: Kyokushinken) was the first Kyokushin karate school in Ohio. The dojo was established by Kancho, Benalio "Leo" Padron, who joined US Kyokushinkai while growing up in New York under renowned karate masters, Oliver, Nakamura and legendary Soshu Shigeru Oyama. After receiving his Shodan-Black Belt in the mid 80's, like so many other martial artist's back then, would meet other martial artist in Central Park to train, learn, and share techniques of their different styles. In the late 80's and early millennium, he was a former full-contact, point style karate competitor and an amateur kickboxing competitor. Once he moved to Ohio, he used the opportunity to train with one of Ohio's top Shotokan Karate masters whom was known for his prowess in tournament and street fighting. In 1993, Padron received his 3rd Dan Black Belt in kyokushin karate and later, receiving a 2nd Dan in Shotokan. In 1995, Padron began teaching for the Columbus City Recreation & Parks and by 2002 the first Ohio school of Kyokushin Karate opened its doors on the west-side. In 2006 Padron took on the challenge and completed the Sanju-nin Kumite (30 man Fight) and was later promoted to 5th Dan Black Belt. Padron also became Ohio's first Kudo coach (Japanese style MMA) until 2013. Through his studies and practice of Budo Karate, after many years of contemplating, he realized his own path and ultimate goal and in 2017 he officially announced his resignation from IKO and he and the instructors of Oyama Juku established the Seireikaikan Budo Karate Organization and founding the style he calls Seireikai Karate. In recognition for his efforts and many years of teaching his method of karate, the SBKO Advisory Committee promoted Padron to the rank of 7th Dan of Seireikai Karate. Kancho Padron is committed to offering the finest, authentic, traditional Japanese karate instruction. Visit us today and become part of our legacy. Osu! 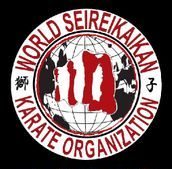 SEIREIKAI KARATE (Pronounced; Say-Ray-Ky) is authentic, traditional Japanese full-contact fighting karate. A practical & effective self defense system, founded by Kancho Leo Padron. A karate style that is based on classic Kyokushin Karate and Oyama Karate as taught by the Original Chief Instructors in the U.S. his new style is a product of the old & new styles of training and fighting. A fusion of 3 styles, Kyokushin, Oyama Karate, and Judo, creating a very unique style , utilizing an arsenal of kicking, punching, and striking combinations, while incorporating grabs, take-downs and throws (Nage Waza), and sabaki movement. A discipline that concentrates heavily on practical fighting and street defensive techniques. 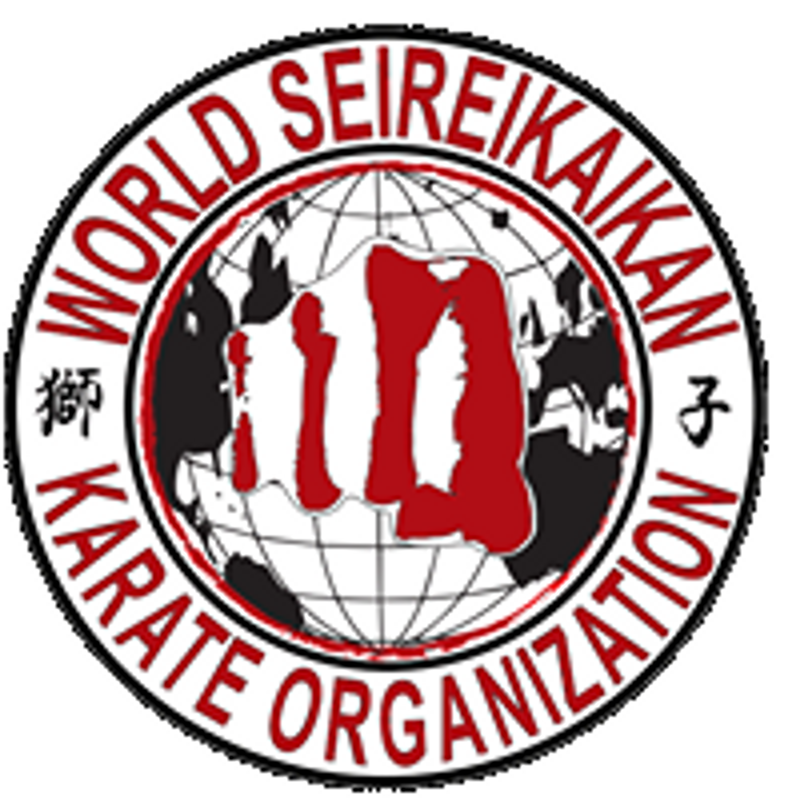 Seireikai Karate training is also centered in the sport of full contact & Knockdown karate competition. The training of traditional Japanese/Okinawan weapons are included in the advanced stages of the Seireikai curriculum. The weapons taught are the Bo, Tonfa, Nunchaku, Tanjo, Sai, and Katana. Seireikai Karate is the learned and tried experience of Kancho Padron and he sincerely believes in the True meaning and the path of the Ultimate Way. "Sincere Devotion, Striving to Overcome, Together as One"
The ZENKEN/SEIKEN; SKO Logo is a very important symbol to our organization. It is worn on the left sleeve of the Seireikai practitioners. The symbol represents what our karate has become today. #1 The GLOBE represents that martial arts is for everyone, without bias in the Budo World. #2 The SEIKEN (Fist) thrusts forward, representing an empty hand prepared for battle, protecting life and society for justice. #3 The GLOBE & Seiken are enclosed by the “ENSO”- Zen circle, symbolizing continuity of movement and mind. The Enso is a also a symbol of yielding to the Fist, and is a reminder to the practitioner to keep themselves from misguided actions through the martial arts. #4 The KANJI is on the sides of the symbol says "LION", this is the spirit of Kancho Padron, the founder of our discipline and that is what makes the symbol of our organization. Classes at Padron Dojo-Seireikai Karate are structured for all skill levels and students are able to learn at their own pace. Under the direct guidance of Kancho Padron, student’s learn determination to challenge themselves physically, spiritually, and mentally, to reach beyond their limits, no matter what the circumstances. Learning to achieve a higher level of physical and mental conditioning. If you are interested in trying this exciting martial art, please contact us to schedule an observation of the class or to participate in free trial lessons. We look forward to training with you!